WASHINGTON — The good news? 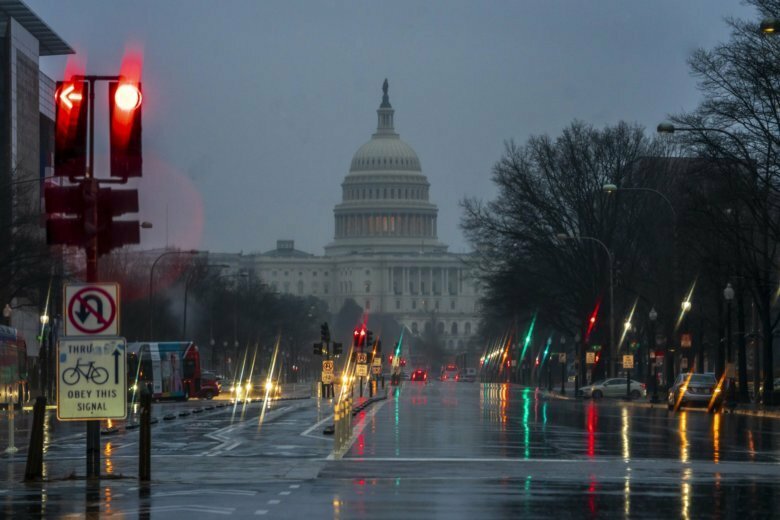 D.C.’s frigid weather blew out on Tuesday night, and high temperatures late Wednesday and early Thursday morning should reach into the 50s. But these warmer temperatures come with rain and heavy wind gusts that arrived Wednesday night. Heavy rain moved in the area overnight, and with that rain comes winds. Gusts Thursday could reach 50 mph, Storm Team4 meteorologist Amelia Draper said, and a Wind Advisory goes into effect from 4 a.m. until about noon. The Flood Watch concerns the immediate counties outside D.C. in Maryland, as well as Anne Arundel, Carroll, Howard, Montgomery, Charles and southern Baltimore counties. It includes the areas inside the Capital Beltway in Virginia and stretches west into Loudoun County and south into Stafford and Prince William counties in Virginia. As if that’s not bad enough, when the rain does clear out — between noon and 4 p.m. Thursday for most of the area — temperatures will plummet. Draper said that the high temperature for Thursday would come in the morning, in the 50s, and would fall to the 30s by the late afternoon. And wind chills on Friday will be in the 20s. Storm Team4 meteorologist Lauryn Ricketts said the combination of semi-frozen, still-wet ground from the recent snow and cold will make flooding a concern, even though the rain totals will be less than the D.C. area received in the late summer of last year. If you’ve been bundling up for an early-morning run over the last few days, you may have a chance to shed some layers in favor of a rain shell as you pound the pavement on Thursday morning. People may be shocked by the temperature swings this week, but Ricketts said that’s fairly normal for the area in the winter. However, after the rain moves out on Thursday night, there is nothing too out of the ordinary ahead. “It doesn’t look like we have any big systems coming our way,” Ricketts said.